Bob Kindred is “the genuine article”. A self-taught player, the Philadelphia tenor is quite simply a natural. His magisterial sound, with its rich, reedy fiber and warm humanistic plaint, flows with a sense of the inevitable. So, too, do Kindred’s heroic and sublimely lyric exhortations. This is a man of deep wisdom, a player who resonates with the legends of the tenor saxophone, but who also commands a singularly powerful and muscularly individuated voice even when he whispers. Kindred’s credits are impressive. He’s been a prime mover in groups led by Woody Herman, Clark Terry, Shirley Scott and Bob Wilber’s Smithsonian Jazz Ensemble as well as his own trio. There’s a timelessness and transparent purity to Kindred’s style that is just plain breathless. Indeed, it’s fair to say that Kindred now ranks with the giants of his instrument; Ben Webster, Sonny Rollins, Stan Getz, John Coltrane and Zoot Sims. But don’t take my word for it. Listen, and listen hard, and listen soft. This is music of exquisite yet vital transcendence. It’s also music with drive and forward momentum. In part, it’s a tribute to Kindred’s accomplished and empathic colleagues, guitarist Gene Bertoncini, Bassist Steve Gilmore and percussionist John Kaye. And, of course, it’s a tribute to Kindred’s Herculean playing, at once ethereal and earthy. Kindred’s format is also inspiration. Instead of trap set, Kaye embellishes with congas. As a result, the music breathes. It also has edge and excitement, and it swings. Though the music more than speaks for itself, Kindred’s accomplishment as the composer of the lithe Crystal and poignant Carino should be noted. So, too, should the perky title track by Sonny Rollins. It’s a joyous ride with a calypso beat, and a fitting commemoration of the mutual esteem of two of our era’s reigning tenor masters. 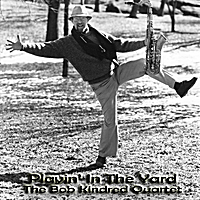 Indeed, listening to Kindred is like listening to the history of the tenor saxophone refracted through a human prism whose clarity and spontaneous creativity define the beat of what the jazz enterprise entails. Bravo!